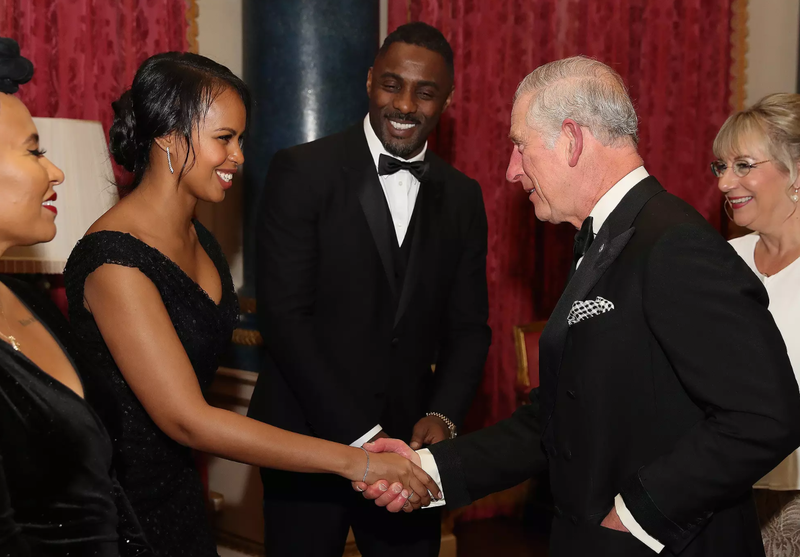 Idris Elba introduced his new girlfriend Sabrina Dhowre to the future head of British royal family on Thursday in London. The Mountain Between Us actor watched with a big smile as Dhowre greeted Prince Charles while at the One Million Young Dinner at Buckingham Palace. The former Miss Vancouver – who wore an elegant black dress with her hair tied back in a low bun – shook the royal’s hand and launched into a brief smile-filled conversation. Just prior to the dinner, Elba, 45, spoke to Sky News about Charles’ soon-t0-be daughter-in-law, Meghan Markle, who is set to marry Prince Harry. Elba had nothing but good things to say about the actress, stating she would be a “beacon” to the people of England. Meghan is slowly being integrated into the royal family, most recently by Queen Elizabeth herself at the annual staff Christmas party at Windsor Castle, which the American actress attended. The party was held in a set of rooms, including the Waterloo Chamber, St. George’s Hall and the Grand Reception Room — an area of the castle Meghan and Harry will become even more familiar with as they plan their wedding in May. “The Christmas party is always held there. They’ll hold the wedding reception there, too. It is a well-proven system and arrangement,” a former staffer told PEOPLE. The news of the holiday party came as the palace announced Meghan will be joining the royal family at their Christmas festivities at the Queen’s country home, Sandringham — making her the first unmarried partner to be on the guest list.